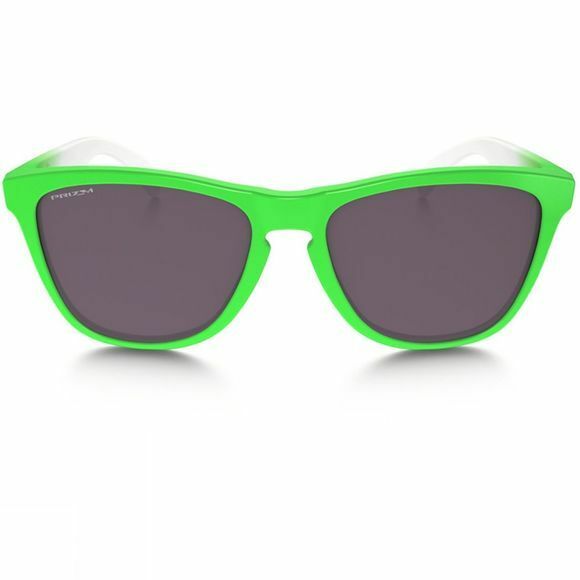 Saluting to world-class athletes who insist on using Oakley technology, Oakley's Frogskins Prizm Daily Polarized Green Fade Edition Sunglasses brings Oakley's ’80s Green heritage colour, to the 21st century. Giving you a chance to own a piece of history, Oakley has resurrected the original tooling from the '80's and brought back the one-of-a-kind sunglasses known as Frogskins. HDPolarized lenses with PRIZM technology helps to filter out 99% of reflected glare, whilst enhancing the contrast and detail ahead of you. Using an O-Matter™ stress-resistant frame material, they're lightweight and durable enough for all-day comfort and protection throughout your adventures. Green is the color of performance and pride this summer, so make sure you grab your share of glory whilst this unique collection is still available. A revolutionary lens technology that fine-tunes vision for specific sports and environments. Meeting or exceed the testing standards of the American National Standards Institute for optical clarity, visual fidelity, and impact resistance. Plutonite® lens material filters out 100% of all UVA, UVB, UVC and harmful blue light up to 400nm. The protection is from the lens material itself.